Obituary for Ora Ingram, published 21 Oct 1957: "sister, Mrs. Arris Pool." Arrie Pool, Wife, W, F, May 1878, 22, md1yr, AL/AL/AL. 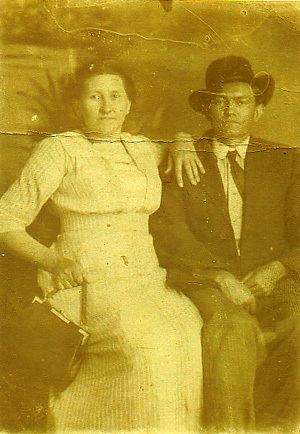 Arra Culpepper married (Mr.) C. V. Pool on 25 Jan 1900 in Pike Co., AL. + Ora C. Culpepper (Ingram), 3 Apr 1880 - 20 Oct 1957. Ora Culpepper married S. G. Ingram on 25 Jan 1900 in Pike Co., AL. Orra Ingram, Wife, Wh, F, Apr 1880, 20, md-0yrs, AL/GA/AL. Charles Culpepper married D. S. Ingram on 24 Dec 1904 in Pike Co., AL. Mabell Culpepper, Dau, F, Wh, 5, sng, AL/AL/AL. "Corda Pearl Culpepper, born 19 Aug 1893 in Pike Co., AL, died 7 Jan 1931 in Pike Co., AL, married Henry Simpson Barr, born 19 Aug 1894 in Pike Co., AL, died 16 Sep 1973 in Pike Co., AL." "I don't know how much information you have on Cora Mae's descendants. We are all living except her oldest son, Ralph Lamar Renfroe, and my son (Breet Popwell) provided the information listed about him on the website. I don't know if he included the fact that before he was killed in Belgium in January of 1945 he earned the Soldier's Medal. I have completed a form with the National Archives to get his records but have not received anything. Neither my father nor his brother Kyle remember the circumstances of why he was awarded the medal, which is for heroism in non-combat situations, I believe. "Here is the information for my family. 1. Ernest Dewey Renfroe, Junior married Alice Olivia Hall in December 1950. They married in Troy, Pike County, Alabama. Their children are: Anna Marie Renfroe (female) born in 1952 in Troy, Pike County, Alabama; Cynthia Renfroe (female) born in 1956 in Columbus, Muscogee County, Georgia; and Kelly Anne Renfroe (female) born in 1958 in Columbus, Muscogee County, Georgia. 2. Anna Marie Renfroe married James Monroe Popwell in December, 1971. They married in Columbus, Muscogee County, Georgia. Their children are: James Breet Popwell (male) born in 1974 in Montgomery, Montgomery County, Alabama, and twins (both female): Anna Victoria Popwell and Lindsey Marie Popwell born in 1979 in Montgomery, Montgomery County, Alabama. E-mail written Oct 2008 to Culpepper Connections from Marie Renfroe Popwell (gd/o #3549), e-mail address. Cora M. C. Renfroe died 23 Feb 1945 in Montgomery Co., Alabama. Marriage* 13 Nov 1921� She married Arthur Lee East at Pike Co., Alabama, on 13 Nov 1921 at age 15. Sheena Hauser wrote on 23 Nov 2009: "I will start with myself and work my way back to Mabel and Arthur Lee East. I married Paul Hauser in 2008. Paul Hauser born 1974. Sheena Evelyn (Lechner) Hauser born 1983 as the twin of Richard Erich Lechner to Carole Marie Mallett born 1961 and Richard Bruce Lechner born 1950. Richard Erich Lechner first married Leigh Ann Adams in 2004 and had a daughter Jade Alexandria Lechner in 2004. They divorced in 2008. He then married Alesha Senn in 2009 (born 1990) and they are currently 15 weeks pregnant. Carole is the daughter of Mary Eunice Jordan born 1929 and Robert Lee Mallett born 7/11/1924 deceased 1/6/2002. Richard Bruce Lechner is the son of Joseph Lechner born 8/19/1911 deceased 02/1985 and Mary Evelyn East born 10/3/1922 deceased 06/15/1975. Mary Evelyn East is the daughter of Mabel and Aurthur Lee East. It is said that East is not his birth name and that he was adopted by his mother's second husband (East) when he was less than 5 years old... Arthur Lee and Mabel had 4 children: Mary Evelyn, Jeanette, Bruce & Charles." Richard Bruce Lechner Born Nov 24, 1953 died October 6, 2015.He was buried October 8, 2015 at Ramah Primitive Baptist Church Cemetery. He was buried next to his mother, Mabel’s daughter,Mary Evelyn Lechner (East) and father Joseph Lechner. I do have a picture of Arthur Lee East & Mabel East (Culpepper) headstone. I also have a picture of the headstone their son Arthur Bruce East b. 2/8/1925 d.2/1/1998 never married and their son Charles Emory East b. 10/29/1929 d.12/19/2004 and his wife Catherine Green East b. 3/27/1937 d.8/9/2006. Find A Grave Memorial# 51219991. Mabel Culpepper (18) married A. L. East (25) on 13 Nov 1921 in Pike Co., AL, Book W-470. E-mail written 2009-2012 to Culpepper Connections from Sheena Hauser (gt-gd/o #3551), e-mail address (Aug 2012). Find A Grave Memorial# 51219973. (Grass obscured the dates above). 1840 Census 1 Jun 1840� David was probably a free white male, under 5 years old, in David Sneads Culpepper of Dooly Co., GA's household, on the 1840 Census on 1 Jun 1840 at Dooly Co., Georgia. David J. Culpepper and Amanda J. Oliver on 14 Oct 1858. D. J. Culpepper (1 slave): 22F. T. A.. Culpepper, 1, M, GA.
Amander E. Culpepper and Augustus L. Thompson on 22 Dec 1875 in Pulaski Co., GA.
E-mail written May 2008 to Warren Culpepper from Carol Hardin Smith (gd/o #58780), e-mail address. Jane E. Culpepper and Thomas J. Ingram on 19 Nov 1868 in Dooly Co., GA.
David Sneads Culpepper Family Bible, in the possession (2000) of Perry Melton Culpepper, http://gen.culpepper.com/archives/ga/misc/dooly-bible-davidsneads.htm "Charlie Lev Ingram was born Sept 11, 1869". David Sneads Culpepper Family Bible, in the possession (2000) of Perry Melton Culpepper, http://gen.culpepper.com/archives/ga/misc/dooly-bible-davidsneads.htm "Annie Lou Ingram was born Sept __, 1871". David Sneads Culpepper Family Bible, in the possession (2000) of Perry Melton Culpepper, http://gen.culpepper.com/archives/ga/misc/dooly-bible-davidsneads.htm "Mary Emma Ingram was born 11th Sept 1873". 1840 Census 1 Jun 1840� Elizabeth was probably a free white female, under five years old, in David Sneads Culpepper of Dooly Co., GA's household, on the 1840 Census on 1 Jun 1840 at Dooly Co., Georgia. Ruthay Culpepper, Dau, F, S, 6M, --- , GA/GA/GA. 18 Feb 1943. Obituary and Funeral Notice for Mrs. Mamie Culpepper Haire who died 17 Feb 1943 in Augusta. 13 Dec 1994, Page 13C. Obituary. Mr. Joseph Obediah Culpepper, Jr., 79, of Augusta, died 11 Dec 1994 at his residence. Interment 14 Dec 1994 in Westover Memorial Park. Hw as a native of Hawkinsville and had lived in Augsuta most of his life.. Survivors include a brother, Robert Culpepper of Jacksonville, FL. William First, Boarder, M, 43, Sng, GA/GA/GA, Cutter in Meat Market. Robert Culpepper, Son, M, 9, S, GA/GA/GA. Joseph O. Culpepper, d. 29 Jan 1936 in Bibb Co., GA.
Mrs. Mamie Culpepper Haire died at the residence, 1849 Ellis Street yesterday morning at 6:15 o'clock after an illness of five weeks. Funeral services will be held at the Central Christian church this afternoon at 5 o'clock, The Rev. J. Glover Morris will officiate and interment will follow in West View cemetery. Pallbearers will be W. W. Taylor, A. J. Gay, Cecil Shealey. Layton Powell, Heygood Ferguson and Vernon Silas. Mrs. Haire, who was 68 years of age, was a native of Dooly County, but had lived in Augusta for the past three years. The deceased is survived by one daughter, Mrs. W. W. Tinley; five grandchildren, Mrs. Thomas W. Israel of Fayetteville, NC, Mrs. R. B. Veal of Miami, Fla., Mrs. R. L. Ledbetter of Augusta, James McDaniel and Miss Beatrice McDaniel of Columbus, Ga; six great-grandchildren; one brother, Bud Culpepper of Cordele, Ga; and three sisters, Mrs. Eva Statham of Cordele, Mrs. Annie Chambliss of Savannah and Mrs. Tiny McDaniel of Augusta. 18 Feb 1943. Obituary and Funeral Notice for Mrs. Mamie Culpepper Haire who died 16 Feb 1943 in Augusta. Kate Culpepper, Head, F, Dec 1862, 37, Sng, GA/GA/GA, Dressmaker. Sarah Culpepper, 1, F, GA.
Sarah K. C. McDaniel, died 02 Aug 1956 at 86 years in Dougherty Co., GA; Residence in Dougherty Co., GA.
Laura W. Culpepper, Wife, F, Sep 1875, 24, Md 4 yrs, ch 0/0, GA/GA/GA. John Culpepper and Laura Goodrow on 08 Nov 1896 in Houston Co., GA.
Laura Culpepper, Wife, F, 43, md, GA/GA/GA, Carder in Cotton Mill. Minnie Culpepper, Wife, F, 33, M, md @ 32, GA/GA/GA, Textile Worker. John Culpepper and Minnie Elks on 31 Dec 1928 in Pulaski Co., GA.
J. S. Culpepper and A. V. Ingram on 06 Feb 1873 in Macon Co., GA.
Virginia Culpepper, Mother, F, 66, Wid, GA/GA/GA. - Virginia Ingram Culpepper, 1853 - 1932. Florence A. Culpepper, Dau, F, 1, Sng, GA/GA/GA. David B. Culpepper, d. 27 Mar 1940 at 66 years in Crisp Co., GA.
- Florence E. Culpepper, 1889 - 1969.